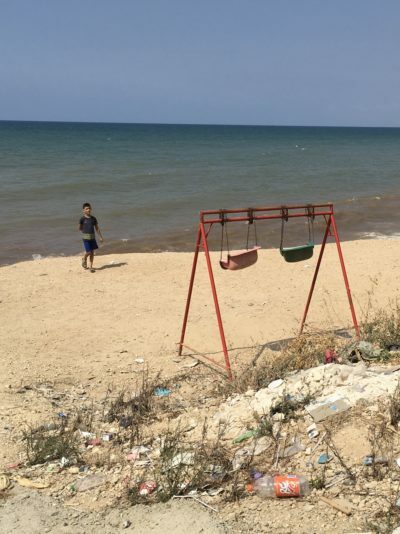 Situated on a coastal location on the outskirts of Tripoli, with golden sands and an expansive view of the Mediterranean Sea, the Palestinian Refugee Camp of Nahr al-Bared could be a beautiful environment in which to raise a child… It isn’t. The sense of despair is as dark as I have known it during these past three years of visiting and listening to camp residents. 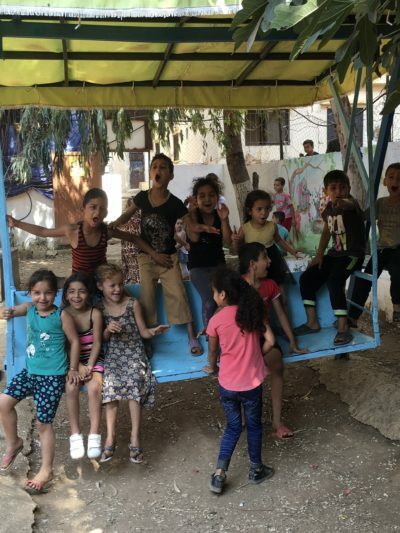 The US Government, under the Trump administration, has cut all UNWRA funding to Palestinian Refugee Camps. 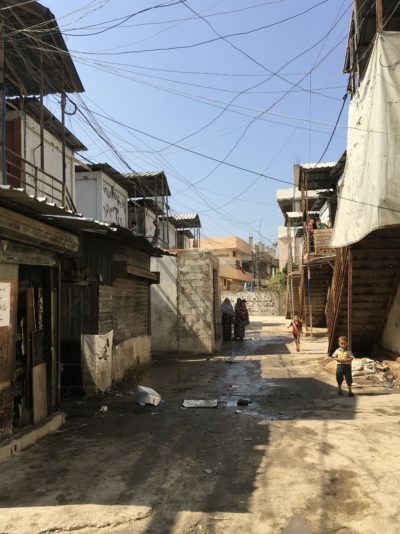 Palestinian refugees living in refugee camps in Lebanon are not allowed to work, own property or have Lebanese citizenship. It is only from being recognized as refugees and the international law of ‘right of return’ (resolution-194) that prevents them from being stateless. Although UNWRA funding keeps them trapped in a state of dependancy, it is also what keeps them alive. UNWRA heavily supports the funding required for medical, educational and social care. Without the contribution of the US, the over strained resources in the camps will reach breaking point. (We are already witnessing a slow, calculated genocide taking place in Gaza.) Saudi Arabia and the Gulf States have offered to pick up the short fall left by the loss of the US contribution, but there are conditions…. conditions that are impossible for Palestinians to accept. Netanyahu is claiming that there are no longer any Palestinian refugees. It’s been stated by Israeli officials that only those Palestinians who were born and fled the 1948 NAKBA (Catastrophe) qualify as refugees. Under this edict the five generations of descendants born in dismal, impoverished refugee camps, would not, therefore, qualify as refugees. Trump, no doubt persuaded by deep state policy directives, would appear to agree. ‘Right of Return’ is enshrined in human rights law. This contrived political move to try to take the ’Right of Return’ away is not only a violation of international law, it makes a mockery of all that is decent and human. Although UNWRA is mandated to support refugees, without proper funding its services are calculated to collapse. Already medical services have been cut so that besides the limited availability of drugs and medical supplies, a single doctor is responsible for around 5,000 patients. In the UK the ratio is less than 400, and in other European countries the ratio is significantly lower. With poor nutrition and salty, undrinkable tap water the strain on doctors is likely to be even more demanding in Palestinian refugee camps. All this flies in the face of human rights. This is a fake deal made to bring about our destruction. They keep us busy just trying to survive so there is no time to plan around the crucial matters. Are we to become a non-people, who, by no fault of our own, are to be cast out of the human race without rights or the means to protect the lives of our children? UNWRA was never set up to be a permanent source of funding but with political intransigency with regard to the recognition of human rights law, Palestinians have been trapped in limbo for over seventy years. It’s only been the hope of returning to their homeland that has sustained them – (Awad Sumud – steadfastness). ‘Right of return’ is the corner stone of the Palestinian Struggle. The US in alliance with the UK and France, along with (Saudi Arabia aka Israel) and the Gulf States, are likely to herald any refusal on the part of Palestinians to give up ‘hope of return’ as a refusal to negotiate peace. The authors of this Machiavellian manoeuvre will know this to be a lie. With truth thrown into the trash bin of fake news, the message of ‘the fault’ being placed on the Palestinians may ‘yet again’ be widely believed. The convenient label of Palestinian terrorists by subservient – cut and paste ‘mainstream’ journalism, allow those who actually do initiate terror to act with an impunity that defies credible belief. Any criticism by right thinking people that Israel is actually the aggressor here, is labelled as anti-semitic. The elders’ fears are fully justified. In 2007 the terrorist group Fatah Al Islam fled into Nahr al-Bared after robbing a bank and were pursued by the Lebanese Army. The resulting conflict resulted in a number of deaths and forced Palestinians to flee the camp. 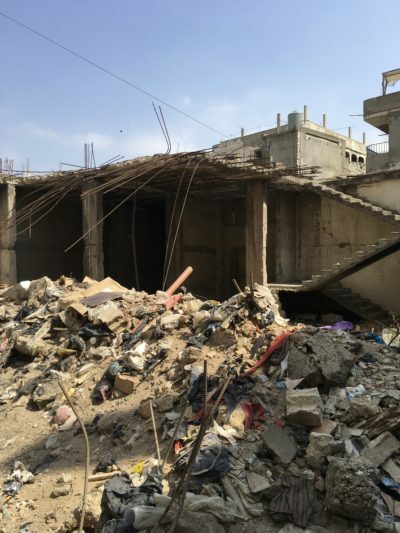 Their homes and what little they did possess were bombed to rubble. 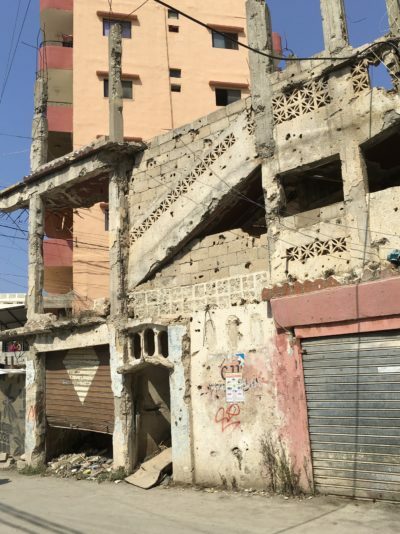 The evidence of the widespread bombing is still present today. At the time Seymour Hersh reported that the funding for the group had originated from the US through Saudi Arabia and had Lebanese connections through Saad Hariri. However, other sources consider that funding came from groups in Syria or Al Qaeda. 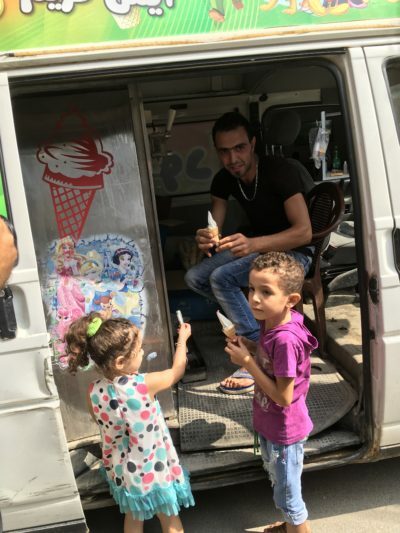 Why they chose to flee to Nahr al-Bared does raise interesting questions. 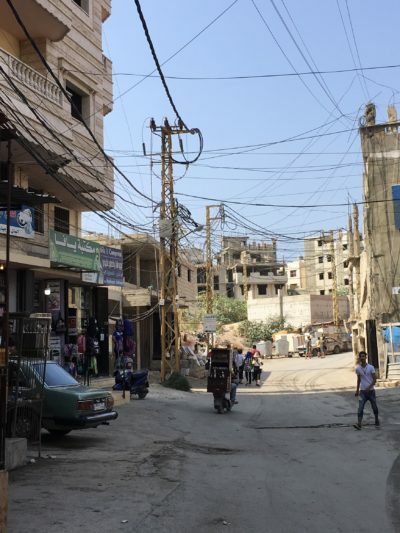 Nahr al-Bared was the refugee camp where the PLO financial centre was located. Whether the camp being situated on prime real estate has any relevance, one can only speculate. Whatever the truth behind Fatah Al Islam, Palestinians remain anxious about such groups ever gaining any kind of foothold in the camps among their dispossessed youth. Today the camp is slowly being re-built and around two-thirds of the population have been able to return. Compared to many of the other camps the roads are wide, the sky is visible and fresh air is able to enter. However it was pointed out that the roads are wide so that tanks can enter. Not withstanding the impact of visual space there is in reality little room for family expansion. Families are not permitted to built beyond four floors and moving out horizontally is also prohibited. Some of the bombed buildings of 2007 have yet to be cleared. With families moving into their fifth and sometimes the sixth generation, crowding is a serious problem. This has been compounded in part by a section of the camp being allocated to Palestinian refugees fleeing terror groups in Syria. Palestinians cannot achieve justice alone. It will require a huge awakening on the part of all people everywhere to recognize that injustice for one is injustice for all. To be silent is to be complicit. Heather Stroud, the author of The Ghost Locust and Abraham's Children, has been involved in human rights issues for a number of years. She lives in Ryedale where she is increasingly drawn into campaigns to keep the environment free from the industrialization and contamination of fracking. Read other articles by Heather. 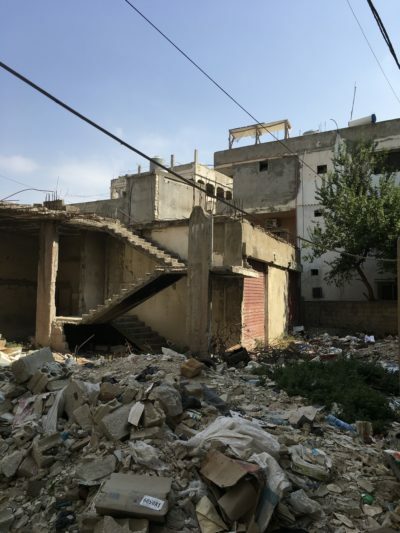 This article was posted on Monday, October 1st, 2018 at 7:58am and is filed under Benjamin Netanyahu, Lebanon, Palestinian Refugee Camps, Refugees, Right of Return, Solidarity, Syria, Terrorism (state and retail), United Nations, UNRWA.